We had our lockdown drill today. After everything that happened in Sandy Hook I promised myself that I would never again complain about a lockdown drill. Practice is what will keep us safe. But I can acknowledge the importance of doing something while simultaneously acknowledging how painful it is. Like going to the dentist. Paying taxes. Or taking away goldfish crackers from my daughter before dinner. When I was a gen ed teacher lockdowns were tough. When I was a special ed teacher supporting kids in the general education classroom lockdowns were tougher. Now that I teach a self contained class they are really pretty awful. The kids did great, all things considered. Any changes in routine are tough for us, not to mention the fact that we just introduced a new friend into our family. We are far from our A game without the lockdown. We survived, we cheered when it was over, and we hope we never have to do it again this year. I understand the importance of it, but like a painful dentist appointment I feel like I deserve a large bowl of ice cream for surviving. And I thank the teacher gods that I don't work here. We got a new student today. That's 3 since September. This is fairly typical of a program for students with intellectual disabilities because the base schools start the year trying their best to meet the needs of all students. As the year goes on and they find that their school isn't the best fit they look to us. The kiddo is awesome- a great addition to our crew. It's just- a new kid is tough! When I was a gen ed teacher I loved getting new kids. It was an awesome chance to reinforce our routines and do some more class bonding. It usually let the kids who had gotten comfortable with an unspoken identity in the class (the class clown, the quiet one, the helper) be forced into a new routine and a new place. It was good- shake us all up, get us on our toes. And that's all still true now, it's just... a bit harder. Today was like the beginning of the year again- trying to predict behavior, somehow trying to get three adults to magically turn into ten so that we could all be in different places at the same time. Change is hard for all my kiddos. It was a long day. It made me realize how far my kids have come since the beginning of the year- how independent they are, how confident and sure of themselves they are- how much I rely on them to be independent so that we can get our learning on. Today felt like that disheartening first day of school all over again when you wonder if it will be possible to ever get to the bathroom again. We'll get our groove back and our new friend will become an integral part of our team, just like our other kids have become. We're lucky to have him and it's going to be a lot of fun getting to know him. I may just need more caffeine in the morning and more ice cream in the evening until we get ourselves on track. Yes, there is something more exciting than putting out water and finding it turned to ice. It's a two hour snow delay when you get to re-live The Snowy Day by bringing in snow and watching it melt (but playing with it first). One of my fabulous coworkers told me she was bringing in a bunch of snow for her class of students with intellectual disabilities to play with. In ten years of teaching why have I never thought of this before?!?!? It was so much fun, with no clean up other than wiping down the table (the table is much cleaner now as well after having all that water scrubbed onto it). We worked on vocabulary (cold, hot, wet, soft, white, melt), discussed the states of water (watching the snow melt and turn into water) and made connections with The Snowy Day. I'd say that was 20 minutes well spent. Before this year writing workshop was always my favorite time of the day. I love helping children get their thoughts and ideas on paper. I love the insights into their world that come out during writing conferences. I love the amount of literacy skills I can teach in a good writing lesson. This year has been a bit different though. Some of my children are ready for a traditional writing workshop with a focus lesson and the independent and guided writing, ala Lucy Calkins or Katie Wood Ray. Some still struggle to draw meaningful pictures or communicate with words or gestures so getting them to write books was a challenge in the beginning. I tried to teach it the way I had before, which worked for some of my kids but not all. So I took a step back and tried to figure out the essential skills I want my students to get out of writing workshop and what skills they need to get there. Writing has meaning. We write or draw pictures to tell a story, ask a question, or tell someone something important. We write for other people. When we write our pictures match our words. Our words and pictures stay the same each time we tell our story. What is on the page doesn't change. We can share our writing with others. When we read our writing we touch each word using one to one correspondence.
. The words on our word wall are also words we can read in books, and are also words we can write in our own books. They are the same words no matter where they are. Words are made up of letters. If you say a word slowly you can hear and record the letters that make up a word (most of the time). Words make up sentences. We need to think about where the words go in our sentences so that they make sense to people. (Sentence structure). Where the words go on the page matters. We plan our writing. We plan our stories, our sentences, and our words. Words have spaces. The spaces help us know where the words start and stop. SO, I took one giant step back. 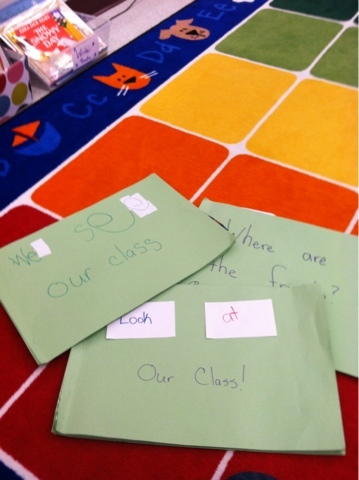 We started using our word wall words to make class books. I started the first of these lessons with a stack of index cards that said 'look', a stack that said 'at' and a stack that had each child's name. 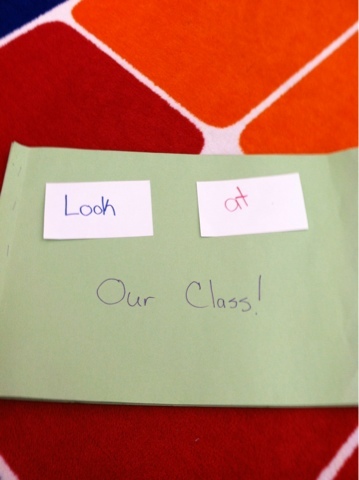 Then as a class we put the words together on the page. We read and re-read and re-read each page. We took turns with the pointer, touching each word. 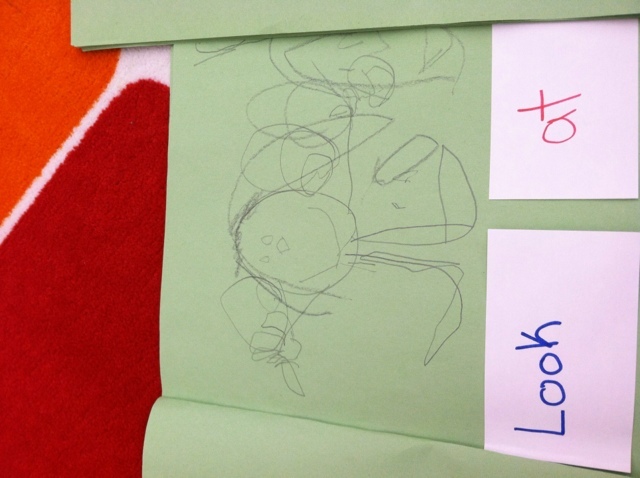 Each child illustrated the page with their name on it so that the pictures match the words. We carefully put the book together and read and re-read the book for days. 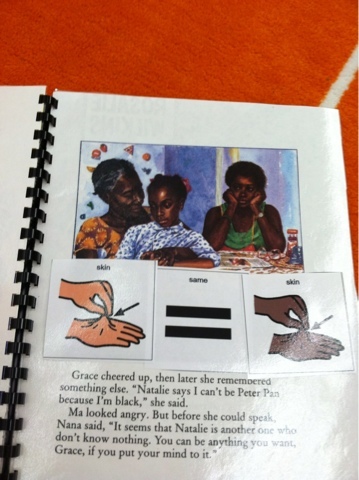 I used the book in guided reading lessons. We re-built the sentences on the word wall. Then each child had the opportunity to make their own book using the same pattern. I differentiated this based on their ability level. 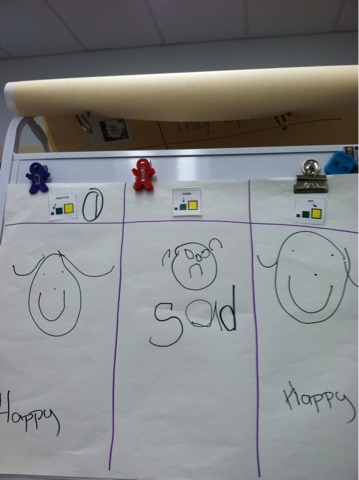 Some children were able to use the program Pix Writer where the teacher types in a word bank and the student is able to select the words he wants to use and put them in the correct order. Some children were able to write the sentences themselves without any aids. 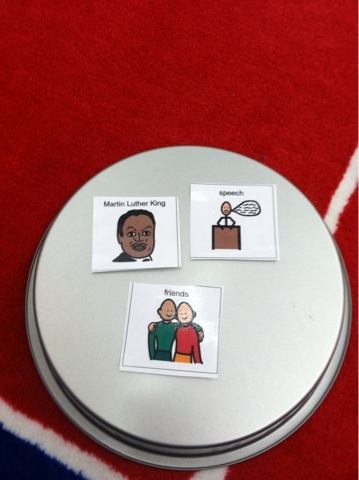 Some needed the words on board maker icons where they were able to select the order they wanted their words to be in and then select what they wanted to say "look at", "come here", etc. They did not have to stick to using the class names like we did in our class book. Instead they had a variety of words to choose from, most around a single topic- farm animals, snow words, school words, etc. 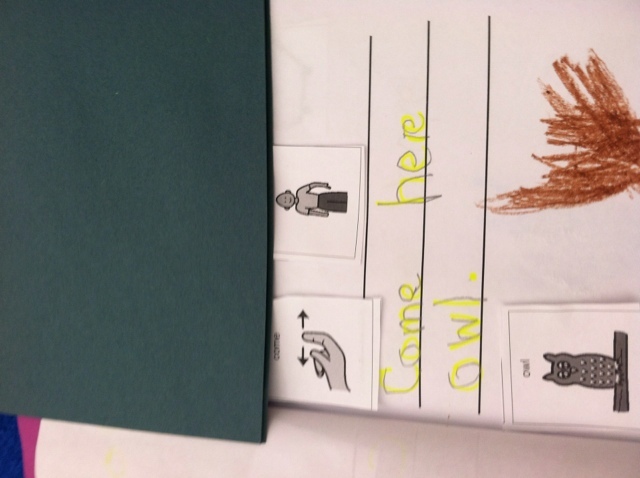 Each child produced a three page book. 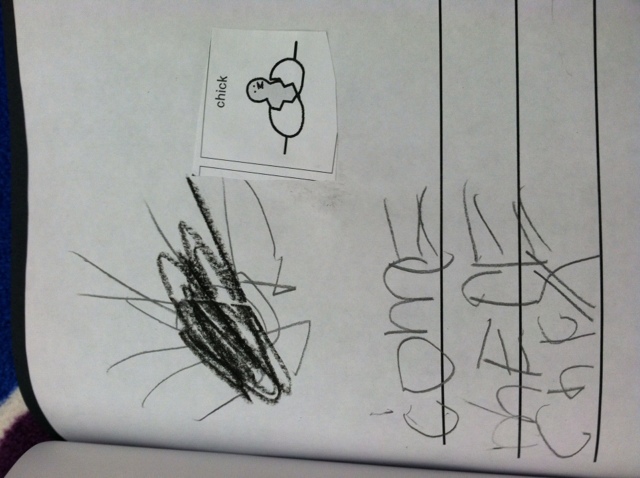 They each had to illustrate their page to the best of their ability. 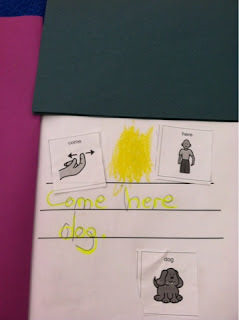 For children working on their handwriting someone may write the words in highlighter and the child can trace the words. At the end of every writing workshop period the children each share (my small class lets me do this) so that they are re-reading their writing and they continue to get the message that we write so that others will read/listen to us. Week 1- we build a word wall based book together and illustrate it. The next day the students work on individual books. As they finish those books they publish them, illustrate and decorate them. After that they can start a new book, try to write a book on the computer (if they didn't before), or work on their handwriting. (In gen ed I separated handwriting from actual writing workshop. Now I need an independent skill for the students to work on, and because they need so much practice in handwriting I find it important to be connected to writing). Week 2: Making a mural using interactive writing so that we can work on all those hearing and recording sounds in words skills that we are missing in our other writing lessons. I'm not 100% pleased with this. I don't like that the kids aren't composing as much as they could be. I don't like handing the kids structured sentences. But for some of them that is where they are. Throughout the day we give them models to talk- so it makes sense that we would give them models to write. There is a lot I am still tweaking and developing. But at the moment each child ends each week with a "published" book that they can read, or at least can point to the words while an adult reads it. They can connect the words on the page of their book with the words on the word wall and the words in our class book. They understand that words contain meaning. It is very different than any writing workshop I ran when I was in gen ed, or even from last year. But we're creating building blocks (I hope) that will give us the language and tools we need to get into more creative planning and writing. We introduced clocks this week. We started our week by going on a clock hunt around school to take pictures of all the clocks we could find. I'd hoped to actually use this adventure to find digital clocks but it is surprisingly difficult to find digital clocks in a school. We are all about analog, all the time. (We may be the only institution left that is, other than analogue clock manufacturers). Although the clock hunt was fun we have a lot of clocks in school. It got old quickly ("LOOK! THERE IS ANOTHER CLOCK!! ON THE WALL!! IN THE CLASSROOM!!!") Luckily some awesome teachers let us take pictures of their phones and their watches. We used the pictures to talk about what we notice in clocks and what the parts of a clock are. Today, after identifying the parts of the clock, we made edible clocks. Tortillas for the face, raisins for the numbers, and celery for the hands. Sticky notes to show how the numbers go in order. I've seen this done with m&ms and Twizzlers instead of celery and raisins, but I was feeling a bit healthy when I went to the store this weekend. (And if you have peanut allergies sunflower butter works just as well). By building the clock this way we were really able to focus on the language piece- in fact, we did this with the speech pathologist. We could work on concepts like circle, around, put on, spread, big and little. We spent a lot of time working on having the children request supplies from us, and worked on following a recipe (from Board Maker). We got a lot of language out of them in a very hands-on, fun way. It was great, although none of the kids ate them. But when it came time that afternoon to identify the short hand and introduce telling time to the hour they had a much better concept of short hand thanks to comparing their celery sticks. It is so hard to even begin to teach about Martin Luther King and segregation. Every year I find myself grappling with it. Just how do you tell 5, 6, and 7 year olds that in the past, but not that long ago, we were put into groups by colors. Sure, we sort their plastic bears by color- red, blue, green- but that is far different than sorting people by color. like I am trying to be mean. There is beauty in their disbelief. Innocence, that they made it this far in life without experiencing what I'm talking about. They don't get it because they don't have to. They already see every body as the same- what's wrong with us grown ups? suddenly makes it seem so much worse. This year I am trying to go at it through the story Amazing Grace. I tried adapting Amazing Grace with Boardmaker icons to make it a bit more tangible and tried to focus on Grace's feelings. Once we talked about her feelings we brought that to MLK- the guy who taught us to all be friends so that we won't be sad like Grace. It is simplistic, but I think it is where my students are. We needed to connect it to something real that could happen to them. Bus boycotts, discrimination, segregation, separate schools- it all seems so unreal and far away. It's important to teach about our past, important to understand where we came from and everything it took to get us away from there. And eventually they will learn that we haven't finished our journey yet- that we still have a ways to go. Charting Grace's feelings. I love the sad face- it's just the right amount of mad. I love making murals with my class that connect to our books. I've found it is a great, meaningful way to connect writing, art, math, and language activities to reading. It is usually an excellent way to support retelling, and it also, frankly, is just fun. Kids love making the murals and they love walking past their murals in the hallway. I like that it is a class project- we work together as a team to produce one picture. We can talk a lot about teamwork. For The Snowy Day mural we painted with cotton balls. We were working on identifying the season, winter, as well as answering the question "When did the story take place?" The art project was a great way to reinforce the winter aspect and connect science and reading. Then each child made their own city scene. They were given four "buildings" and told to put them in order from longest to smallest (a math objective). After they'd illustrated their buildings we covered them in snow as well and added them to our mural. After all, where does The Snowy Day take place? In the city. We made tear-art snowmen, which I will admit worked better in a gen ed classroom than with m y group this year. Usually what I love about tear-art snowmen is that they never end up looking the same and always look kid-made. My students had a tough time tearing the paper into circles though because of their fine motor skills, but the snowmen still turned out pretty cute. We added them to our mural in order from smallest to tallest as well. I love our Snowy Day mural, but I also feel like I could have done so much more with it. There is so much potential here. Peep, peep, peep, we've got that beat! My new favorite read aloud is Farmyard Beat by Lindsey Craig. It's got a fantastic beat so it really promotes reading with fluency. We've had some fantastic interactive read alouds and shared readings with it. We've been rocking to the beat for 2 weeks now. 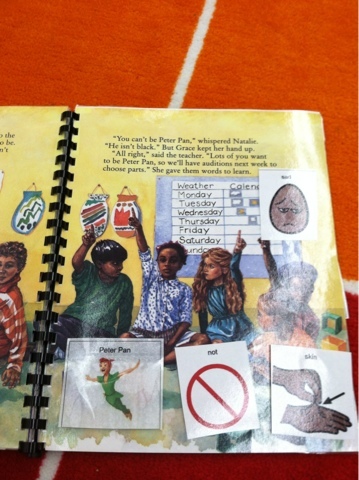 We started by reading it during reading workshop as a shared reading. We worked on our fluency and reading with expression (and of course just our general reading-love). Then we transitioned into answering those essential 'wh' questions that fill everyone's IEP. "WHO is in the story?" "WHERE did the story take place?" "WHEN did the story happen?" "WHAT happened first? Second? Last?" It went into the retelling center so our kids could act out the story with the physical objects (the barn and toy animals). Then we moved the story into writing time and we started to make our mural. We worked on interactive drawing to make the barn, and used interactive writing to add our words. I find interactive writing to be one of the most meaningful forms of writing instruction and I've realized that this year I have not done enough of it. In just writing the words "peep, peep, peep" on the paper we were able to discuss saying words slowly to hear the sounds, matching sounds with letters, matching similar sounds (what else says p? ), using spaces between our words, letter formation, one to one matching, not to mention the message that writing contains meaning, which is why we do it. Our interactive writing was divided between two days because one sign a day is about all my kiddos can handle. We also added a math element when we made our animals. We worked on identifying shapes- circles, squares, triangles, and rectangles to make the animal bodies. Then we talked about halves and we cut our circles in half to make the chicks. We were able to practice using the language big and small as we followed directions to put our chicks and cows together. During another lesson we used 'mat man' to work on drawing our self-portraits that we could add to our mural. Many of my students don't see a purpose to drawing, or independently will not draw a recognizable image. Mat Man guides them to include all the aspects of their bodies- the head, the body, the legs, arms, eyes, ears, etc. We've been using Mat Man since around November and we've seen an amazing improvement in their drawing ability. Their self-portraits for our mural were fantastic. I think what I love the most about this is that no matter how much I try to squeeze from this book the kids don't ever seem tired of reading it. There is nothing like sharing a good book with a class that goes across curriculum areas. I arrived at school this morning to have my coworker hand me this article. It is amazing. Preview- it's about a teacher who doesn't like kids. It was clearly the right type of humor to start my day so that I was able to find amusement in the little things. Me: Friend, we need to clean the tables. Go get a wet paper towel. Me: Friend, where is the paper towel? I asked you to get a wet paper towel. Sure enough, there is a wet paper towel sitting in the trash can. She followed directions- she got the paper towel and wet it. She did exactly what I told her to do. Me: Wear your pajamas inside out tonight so that it will snow! Friend 2: Hooray! Wait, oh no, I don't wear pajamas. Me: What do you wear? Friend: Ummmm..... not pajamas. How will it snow? Me: Well, wear your clothes inside out. Friend: I don't wear clothes. Me: Wear your jammies inside out. Friend: Oh! Jammies! I wear those. It's the little things during the day that make me giggle. My new philosophy to break the January blues is to get excited every morning about one thing I'm really excited to teach. Every moment in the morning when I start to think about all the little things that are going to stress me out during the day I force myself to change my thoughts and force on that one lesson I am going to rock that day. I finished the day with an extra amount of energy and purpose. I loved my job. I loved my kids. It was a beautiful, beautiful day. I woke up this morning determined to do the same thing. Every time my mind slipped to all that stress I forced myself to think about my interactive writing lesson. I pulled my car into the parking lot, excited and energized. I entered the building with excitement and energy. Then I went immediately to a meeting. I am now planning on moving to Australia. But my plan worked for one day, so perhaps it will work again tomorrow. During recess I watched my class recover from their initial disappointment of being stuck indoors because of the rain. They'd tried to convince me that they'd be fine outside despite the rain drops, but regardless we were holed up inside our classroom making the most of it. We invited another class in the intellectual disabilities program to join us. Their teacher and I sat back and watched as our kids interacted with each other in pure free play with the toy kitchen, doll house, toy barn, and toy castle (Thank you Donors Choose folks!!). It took a few of them a bit to get into it. At first they sat there, staring at the toys, unsure how to use them to interact with one another. But they slowly became more and more engaged in it. "Make the doll go through the door"
"Can I have the little cup?" "Who is playing in the house?" These are skills we work on every single day, sometimes with flashy games on the smartboard that I guess you could technically say we were "playing". But nothing as authentic and student led as this. We ended up letting them play for an entire hour. They were so engaged in imaginative play and working so calmly, in ways we'd never seen before, that we just couldn't bring ourselves to stop it. I can honestly say that they got more out of that play session than they would have gotten out of the smartboard lesson I'd prepared on Martin Luther King, Jr. I think the thing we forget when we think about play in schools is just how much academics our kids get out of play. They need a chance to apply these abstract skills they are learning to their concrete lives- by playing. 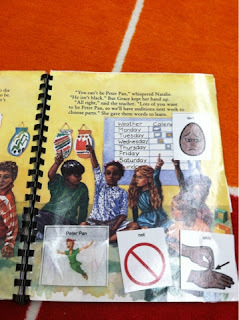 They can count money, retell stories, use their social language, and read recipes- all while "playing". I watch my 16 month old play kitchen and all I see is how many skills she is learning at that exact moment. She's not playing- she is working hard. Our school kids need that too. I get so much authentic data from free play- and that's at times when I know the skills are secure- that's when they can do it unprompted, independently, and out of context. I know I'm preaching to the choir, but I wanted to share our absolutely beautiful hour of learning from this afternoon. It is a staggering moment when you realize that so much of your class community may have been built around one dynamic personality. These kids are so young, but as a group they are still completely capable of forming their own functioning family, where each personality finds its spot interwoven with everyone else. One of my friends is out for what will most likely be a long time. Last Wednesday was her last day. On Friday one girl kept repeating, "maybe she'll be back in ten minutes, ok?" While another non-verbal boy kept going to our friend's picture and moaning. Today was more of the same. Nothing feels right. We're just off. Our missing friend isn't always the best behaved. In fact, I probably have some premature gray hair thanks to her antics this year. In the moment it is easy to get frustrated with kids like her- the ones with busy hands and never ending questions. The ones who need what feels like a hundred reminders to follow a simple direction. Yet all those irritating moments- the reminders, the redirection, the teacher deep breathes where you remind yourself that you are an adult- it is all worth it for the awesome kid you get to teach. It can be hard to see it in the moment but stepping back makes us appreciate just how great these kids are. I want nothing more than to have those busy hands back so that our class can get back to its normal state. One of my kiddos just left us for an extended medical leave. We knew it was coming- something the family had been preparing for over many years, but it is still hard to accept that someone so little is going through something so big. I haven't been able to get her out of my mind all day. As teachers we love to have control- control of how we teach, our classroom, our kids. We mama-bear our kids at every step of the way- protecting them from all sorts of dilemmas, difficulties, and injustices. It's hard when something comes around that we can't protect them from, especially because in the adult world we can comprehend that it is a good thing in the long run. Long run good things are difficult to ask young kids to buy into. Long run good things aren't exactly any child's speciality, especially if that child has a disability. Yesterday we had a celebration of our friend because that's what she wanted. She told me exactly what kind of cupcakes and icing she wanted, and exactly who she wanted to come to our party. All the kids thought it was her birthday and in the end I let them think that. It was too much on her to explain over and over what the celebration was for. Although most of the day was difficult for her, she was a rock star at her party. I've seen hostesses from the south who weren't as gracious and welcoming as she was. She practically waltzed around the room, fetching water for her guests, welcoming adults into the room, and chatting with her peers. She'd even put her hand on my shoulder as she walked past me, silently telling me she had it, she could manage the party. She's strong and determined. She hosted the party and I know she'll use that same determined spirit to get through the next few months. I just need to calm myself down and remind myself that she will be OK. Thanks to our awesome Donors Choose donors we have a toy barn and farm animals to use to act out stories we've read. Today I put Farmyard Beat into the retelling center- asking the children at that center to act out the story using the barn and the animals. I modeled what I expected and then set them loose. I occasionally heard one of the girls tell the other girl not to play, and by the end of reading workshop I could hear a bit of non-retelling behavior. Yet when we gathered back on the rug as a class for share time my skepticism of their behavior vanished. I started by asking them specific questions about the story- out of order- "What happened last?" and they were able to tell me, without prompting, using detailed, specific language. Because they'd acted it out they had a much firmer grasp of what happened in the story. They were answering questions that were beyond their specific goals and objectives and showing me a true understanding of the story- hooray for comprehension through play! Long time readers will know that I have an absolute hatred of head lice. I believe it is one of the leading causes of the achievement gap, and that it is actively working on trying to destroy school attendance. So I was ridiculously confused when I read that congress has a lower approval rate than head lice. Who approves of head lice? I can't comprehend. Is there someone out there that finds the benefits in it? On Friday all three of my second grade students were absent for various reasons. These three girls also happen to be my most lively and talkative. When I plan my lessons I frequently plan with them in mind and then think of ways I can differentiate for the other students. This way I'm holding out high expectations for all my kids and the kindergartners and first graders benefit from the strong examples the second graders set. Without our three class leaders on Friday we were struggling. I hadn't even realized how much I rely on my second graders for class discussions, choral reading, and just general liveliness. Typing this sounds like I only teach my high students and I leave the rest to just watch, but that's not what happens (at least I hope not). I do, however, structure my lessons so that my higher students are pulling the other students up. One of my kindergarten students, who came in unable to recognize her name in print and didn't know any of the numbers or letters of the alphabet is now flying because of how much she works with the second graders. They model more than I could teach without them. When they were gone on Friday it brought a huge downside to self contained programs like mine to light. When there are no language models, no one to giggle with the story, sing along to the repetitive learning-rich songs, there are less opportunities for the other kids to learn. And the other question to ask is- if the second graders are pulling the other kids up academically, who is pulling up my second graders? In the case of all three of them I would argue that they are in the right placement for their learning needs, but it is still a good question to ask myself- am I giving them opportunities for learning growth? Am I keeping high expectations for them like I am for my other students? I fully believe in self contained programs like mine for certain children. I have seen it be the absolute best learning environment for some children- I have seen these children thrive in these smaller environments as opposed to flounder and be forgotten in the bigger, faster-paced classrooms. However, on Friday, with my four quiet, reserved students my class felt pretty restrictive. Kids learn from one another and there wasn't much of that going on without my second grade kiddos. Two of my kiddos are making a ridiculous amount of progress- progress that no one ever expected them to make in such a short time- and I truly believe it is because they are in with these second grade language models. If these older girls were not in our classroom the younger students would remain as they were when they came into my classroom. The rooms they'd been in the year before didn't offer the language models and high expectations my second graders provide. This meant that no one even knew to push these kids or give them the opportunity for growth. It's not my teaching that's driving them ahead- it's the opportunities and models they've been given. It once again reminded me of what a serious decision it needs to be when a child is placed in a self contained school setting. It can be the absolute best thing for a child, but it can also be limiting depending on factors outside of the control of the IEP team. I know I've written this time and time again, but it just isn't a decision that can be taken lightly. I just wish every school system and every IEP team takes the time to consider the decision in every possible light. My newest favorite books with Baby Lipstick is Lindsay Craig's Farmyard Beat and Dancing Feet. I'm thinking these upbeat books are exactly what we need to get us up and moving and back to being excited about school. I discovered Farmyard Beat because I checked it out from the public library as a digital copy. My daughter's been reading it with me on my ipad mini (can I tell you how much I LOVE the fact that I have digital board books we could read over Christmas break instead of hauling an entire duffle bag of board books around? Obviously we still took board books, but not nearly as many as we took over Thanksgiving. And now she associates my ipad mini with books and reading instead of playing games. She sees it and says "book, book? so we can read together). I'm pondering whether I should buy the kindle copy of Farmyard Beat and read it to my kids on the smartboard. It's like a big book- just without the actual book for them to hold and read independently later on. I love that I can put the book on the smartboard- and that it would mean I'd have the book for my daughter and my class at the same time. I just don't like that it means there isn't a physical copy of the book in my classroom. I want my kids to engage with the book- touch it, turn the pages, read it to themselves. I want them to act it out with the physical book right there. I don't know when the last time was that I read a real book. I've been reading books on the kindle ap for the iphone for years. With my active little one I find that I miss reading real books for pleasure but that it is so much easier to read digital books. I'm reading more than I would otherwise. I am thankful to digital books for this reason. A story is a story no matter the format. But can I make the transition in my classroom? Would my kids get the same experience out of a digital book? Is it worth it? I have a confession. I really, really don't like Jan Brett. I don't know why. Maybe as a kid the pictures actually scared me a little. Maybe I find them wordy and slightly boring to read to my kids. Maybe I am just a bad person. I think they may take away my teaching license if they discover that I'm teaching young students and I don't adore her. But I just can't get into her books. I'm currently trying to read The Mitten with my class. In past years I would use different versions of The Mitten to compare and contrast and talk about one story but I'm not sure my kids are ready for that this year. We're currently reading one book for two weeks. I adapted The Mitten- made it a touch and feel book for my kids. I put little mittens on each page- slowly growing bigger so that we could pull in comparing sizes- smallest to biggest. I put the numbers of the animals on each page so we could use it to count. We even can use it to discuss the concept of zero since after the final sneeze there are zero animals in the mitten. I put boardmaker icons on each page to help with my children's vocabulary. I have small toys of all animals that hide in the mitten so that the kids can act out the story. I'm still bored to death. We've only done Brett's version of The Mitten for three days and I'm already dying. I think my January blues may be stemming from this rather monotonous misadventure. It would be easy and make my weekend much simpler if I stick to my lesson plans and we continue to do The Mitten for the next week. I just don't think I can take it. It's time for some serious changes so that we'll get our groove back. It is cold. There isn't a other break coming up any time in the near future. My body is still craving day long grazing on Christmas sweets and slowly sipping on coffee as I lose track of exactly how many cups I've had (why count, it's Christmas?) The kids are adjusting from 11 days of not waking up and getting on the school bus. Everything just seems foggy. We're in school, but only physically. Our songs are not as loud or as spirited, our read alouds not as engaging, our lessons not as perfectly paced. It's the time of the year where I feel like I've been in school forever. This means I feel everyone should know what I've so carefully and thoroughly taught. We just went through all these months- the year is almost half over- and what do we have to show for it? They still don't have down all those concepts I've been teaching since September. Especially now, coming back from break, they seem to have forgotten everything- everything- I've ever taught them. Hand raising has gone out the window so you can forget about addition and subtraction. It feels like starting over, like we are going to have to repeat the months all over again. We'll get back our grove, relearn and remember what was taught, and find that we are actually being successful. Eventually. Right now we're in a bit of a rut we've got to crawl our way out of it. We can do hard things. I just wish we could do the from bed with books and hot chocolate. I am beginning to wonder if it isn't the hormones in our meat, the pesticides on our vegetables the violence on our televisions and the unending amounts of social media our kids are exposed to that is causing a rise in ADHD. Maybe it's not the outside world killing our kids' attention spans, but it's the world inside our homes. Maybe it's us. On Christmas Day my 15 month old daughter and I had a tremendous disagreement on how one uses markers. A family member had given her a set of age-appropriate markers and I sat down with her, excited to teach her this new skill. She loves to color with crayons and pens so I was pretty sure I was about to blow her mind when I demonstrated what markers could do. As I sat down to work with her I quickly realized that she had no intention of using markers correctly. She wanted to take them in and out of the box, line them up, roll them, and then scribble on the paper with the tops on. Whenever I took the tops off the markers for her she'd cry, say "Uh-oh" and then turn the marker over and use the bottom of the marker to rub on the paper. You know, NOT making any marks at all. This also meant that the now opened tip of the marker was in her hand and pointing to her clothes. Awesome. No matter how many times I showed her what markers could do she continued to "color" with the marker backwards, or just build, stack, and roll the markers. I wish I could say I followed her lead. I didn't. I wouldn't give up trying to get her to make marks on the paper with the markers. There were tears. And some huffing. In the end we both needed to cool down and we sat in front of the Christmas tree, markers far from our view, practicing taking deep breaths. Why couldn't I just let it go? The marker box said 18+ month, so already I should have known that using them would involve higher skills than she had. And she was happy using the markers without actually coloring. Why did I have to push it? If I'm honest with myself it's because I was bored. As an adult in this current world I've become accustomed to being entertained. And my daughter wasn't entertaining. She was doing the same thing over and over again. I notice this frequently when I play with her. I am constantly fighting the urge to redirect her to play another game. She is perfectly happy taking her bib and wiping her baby doll's mouth- over and over and over and over again. But I can't let it go. "Can you feed your baby?" I hear myself asking. "Can you make your baby go night night?" And when she doesn't respond to that I find myself looking at her other toys. "Let's play with a puzzle. Want to color? Here's a ball?" I'm teaching her to focus on things very quickly, for brief amounts of time. If I'm not very alert and aware of not interrupting her play with my own attention span I am going to create a monster who doesn't know how to engage in toys without direction, and will automatically get bored with an activity after 3 minutes. And it's not her- it's not my daughter's attention span- it's mine. I feel like in general I am a fairly patient person, a fairly educated person when it comes to child development, and am fairly in-tune with my daughter's needs. So if I find myself fighting the urge to constantly change my daughter's play schemes in order to entertain myself, I know other parents must be doing the same thing. I'm sure I'm not the only parent who quickly gets bored during my quality play time and finds myself distracting my daughter. Perhaps if we learn to let our children learn to play we'll see an improvement in our children's attention spans.